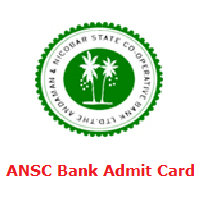 ANSC Bank Admit Card 2019 (Clerk, MTS, Junior Auditor, Hardware Engineer, Computer Assistant) will be issued by the Andaman & Nicobar State Cooperative Bank Limited (ANSCB) officials at anscbank.and.nic.in. The ANSC Bank Hall Ticket 2019 is a mandatory document for the candidates who are going to participate in the ANSC Bank Examination For Clerk, MTS, Junior Auditor & Other posts. All the applicants must download the ANSC Bank Call Letter 2019 from this page by hitting on the below given link. Through this article, candidates can get Examination Date, Admit Card Release Date, Importance of Admit Card and Downloading Steps. Moreover, at the below of this page, we have given a link to download ANSC Bank Admit Card 2019. So all the competitors should use that link and download the Andaman & Nicobar State Cooperative Bank Limited Hall Ticket 2019 quickly. The ANSC Bank Clerk Admit Card 2019 will be available through online mode at anscbank.and.nic.in. Applicants need to download the Andaman & Nicobar State Cooperative Bank Limited Clerk Hall Ticket 2019 by entering the login credential information. All the applicants must download the ANSC Bank Clerk Admit Card 2019 before the exam date to skip last minute issues. At the time of downloading the Admit Card, many of the candidates facing so many technical issues. To reduce all those issues at the end of this page we have given a link to download ANSC Bank Clerk Admit Card 2019. The ANSCB officials are planning to conduct the written examination for Clerk, MTS, Junior Auditor, Hardware Engineer, Computer Assistant posts in the month of May 2019. Candidates who had applied for ANSCB vacancy posts, they need to prepare well for the examination without wasting valuable time. Up to date, the officials didn’t declare any particular date related to the examination. Once the examination date is out, then we will notify you through this article. So all the applicants keep connected with this site to know frequent updates about Examination. Andaman & Nicobar State Cooperative Bank Limited (ANSCB) main page will open. Find the ANSC Bank Admit Card 2019 link in what’s new section. Now ANSC Bank Hall Ticket 2019 will open. Take a printout of hard copy to carry for the examination.